Wastewater effluents from food production are treated in an external forced circulation (EFC) anaerobic reactor, producing clean water for reuse and generating operating power. A candied fruit manufacturer sought to double production and simultaneously reduce overall costs while increasing its wastewater treatment capabilities. Fluence provided a custom solution: Wastewater effluents from fruit, candies, and jam are pretreated, then treated in an external forced circulation (EFC) anaerobic reactor. The results include energy production for the plant, and treated effluents that are clean, suitable for reuse, and safe for the environment. Costs at the new plant are 35-40% lower than at the previous one. In 1963, Angelo Goffi founded Italcanditi, a candied fruit and marrons glacés manufacturer. The company diversified and expanded over the years, and in 2002, Vitalfood-Italcanditi was created. It has since become a European leader in the production of glazed chestnuts, candies, jams, and other ingredients for the food, bakery, and dairy industries. To handle these necessities, Fluence provided a custom design. The wastewater entering the system first undergoes an anaerobic pretreatment through an EFC reactor, generating biogas. A cogeneration system turns the biogas into electrical and thermal energy, which is fed back into the plant, reducing energy costs. Finally, the remaining wastes are treated by an aerobic stage, supported by biological oxidation and final clarification. The plant puts out water that is clean, reusable, and safe for the environment. Because the biogas-fired cogenerator produces more energy than needed to run the plant, the un-needed electricity can be sold. Waste-to-energy technology not only helps purify water, but it also can transform organic waste into thermal and electrical energy. Can Fluence help your business? Contact us to find out. 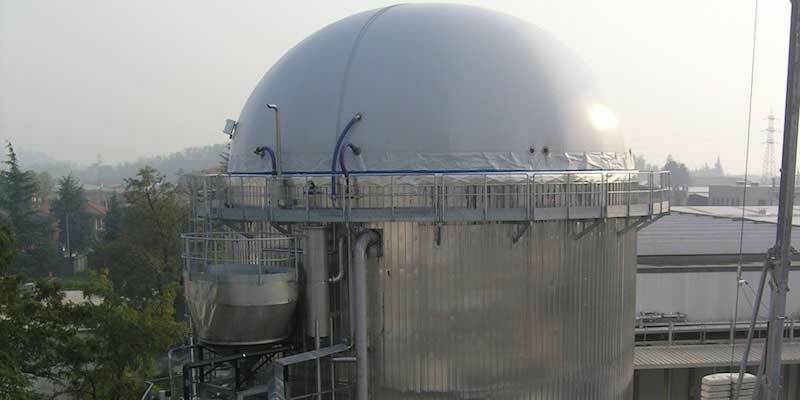 External Forced Circulation (EFC) Reactor, Aerobic Treatment, Biogas-Powered Thermal and Electrical Cogenerator.